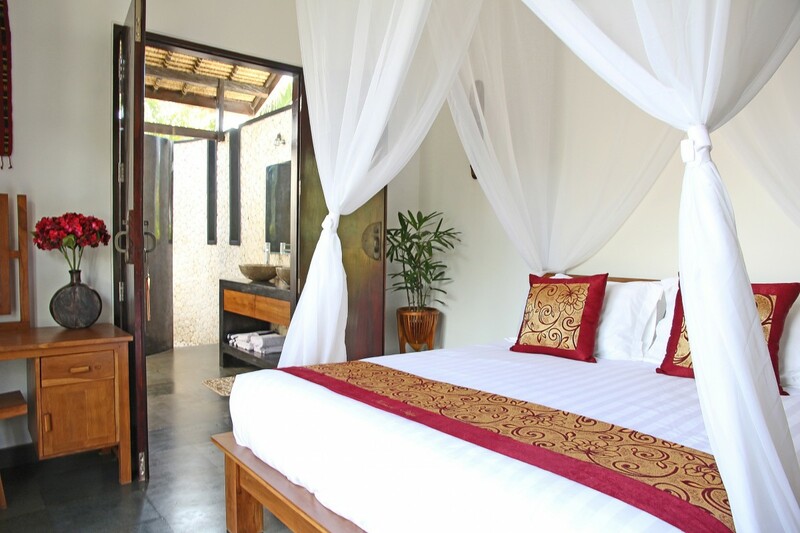 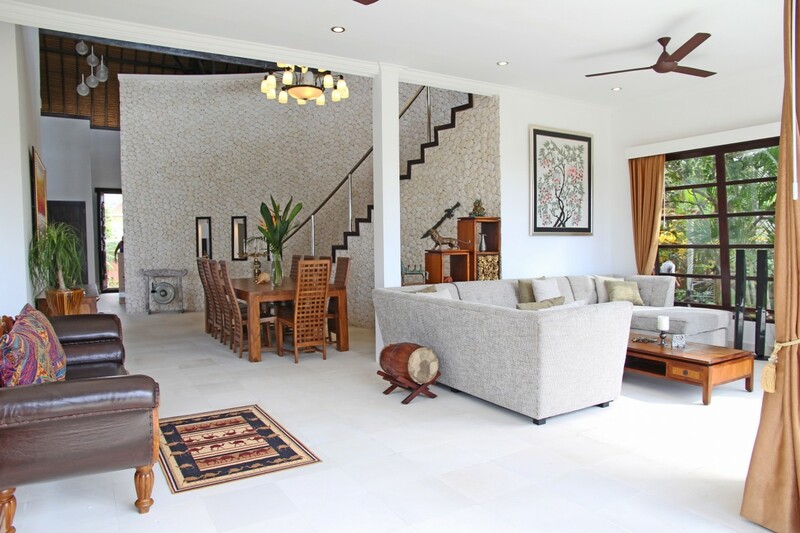 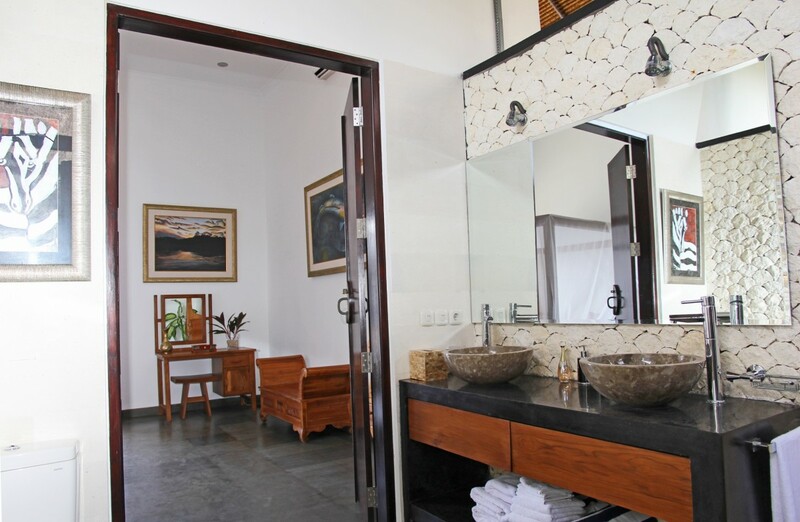 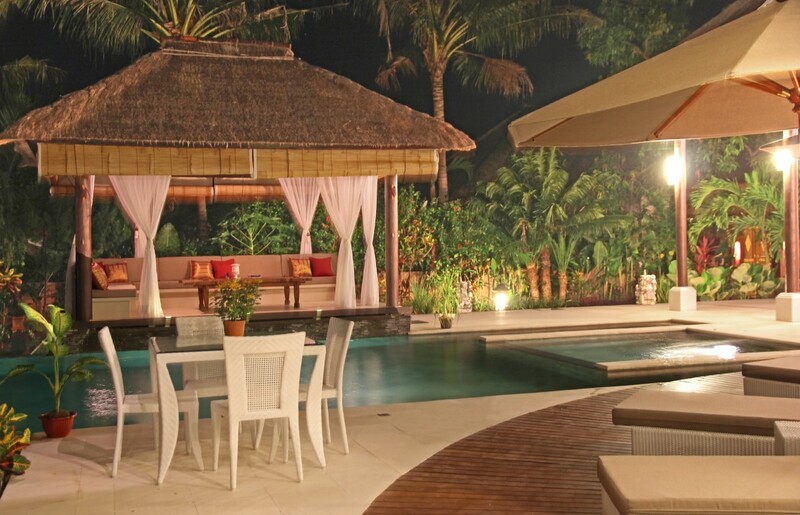 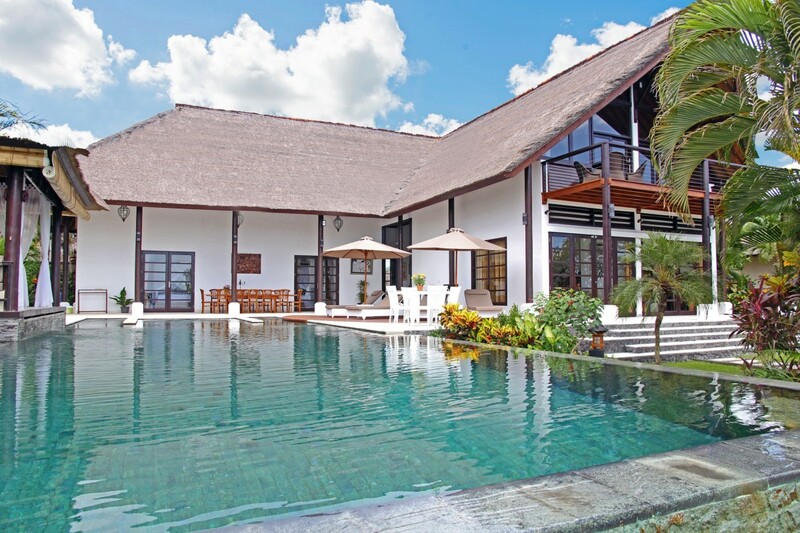 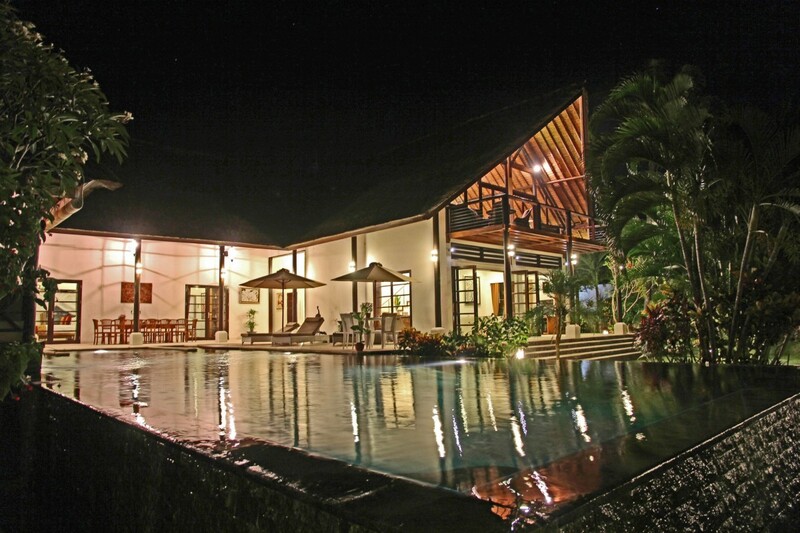 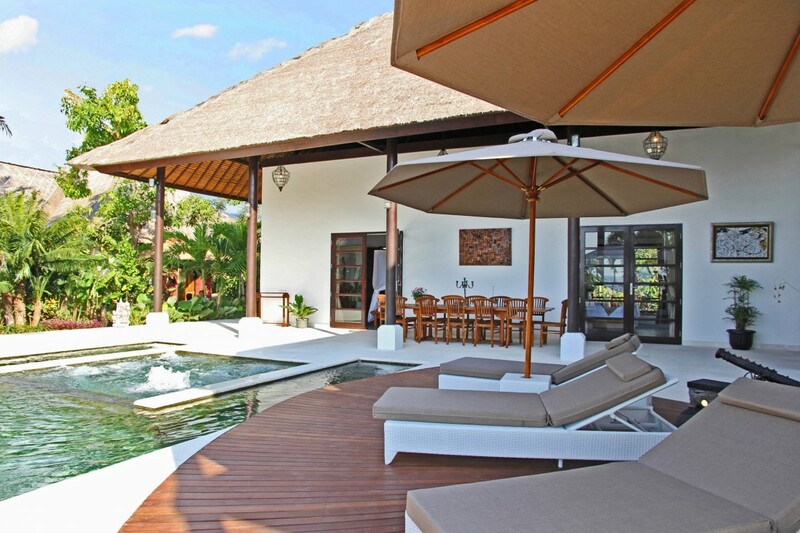 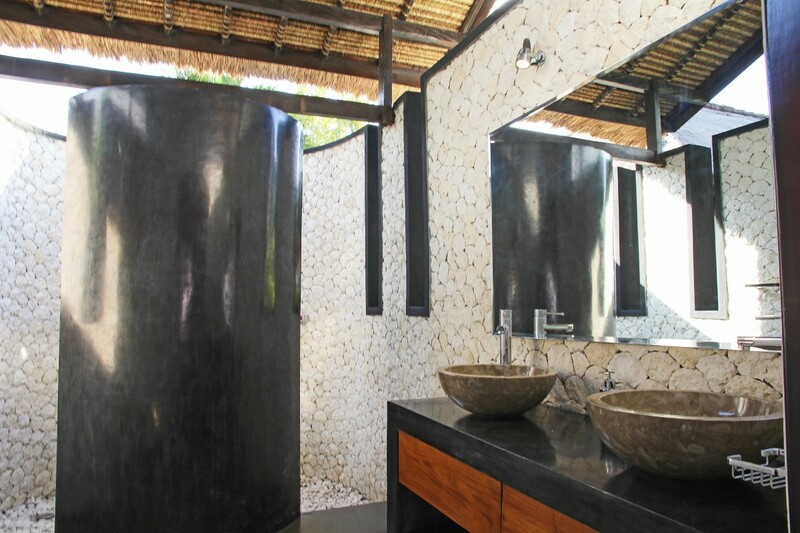 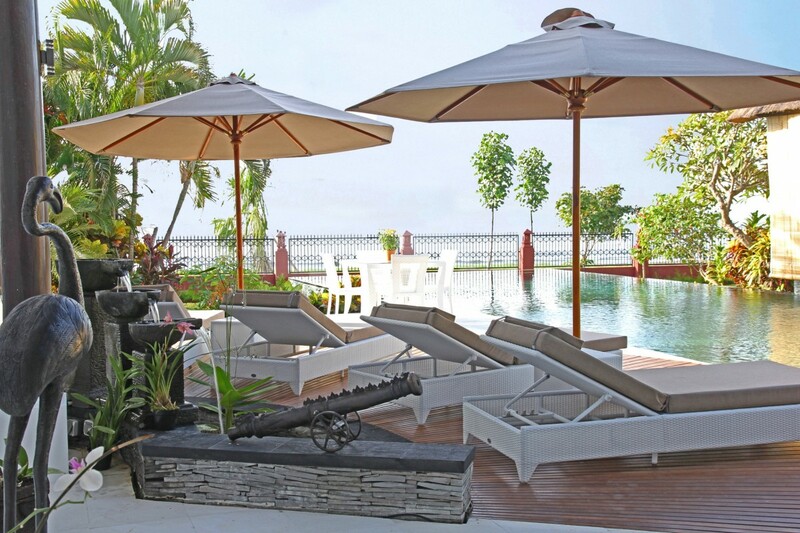 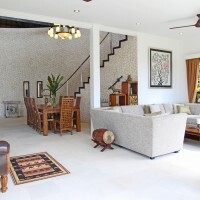 Trimurti Villa is a topclass 5 star accommodation with a beautifully landscaped tropical garden; on a private plot of 1400 m2 and a 30 meter wide beachfront overlooking the Bali Sea. 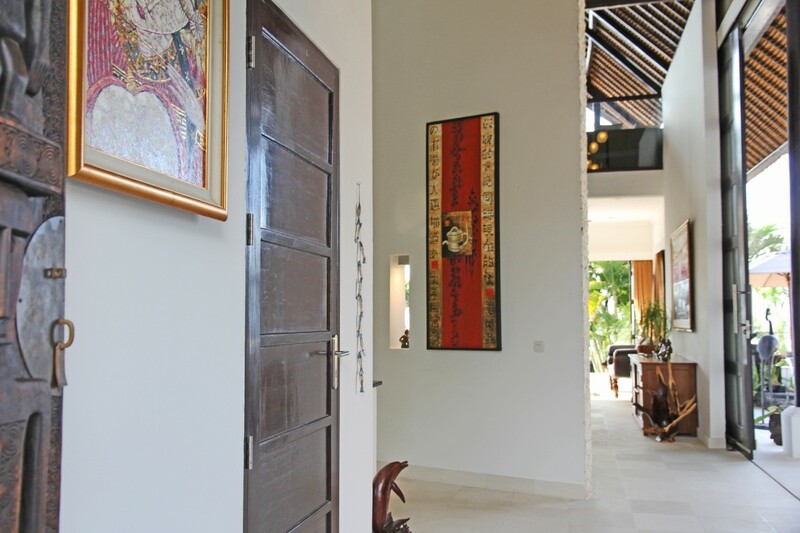 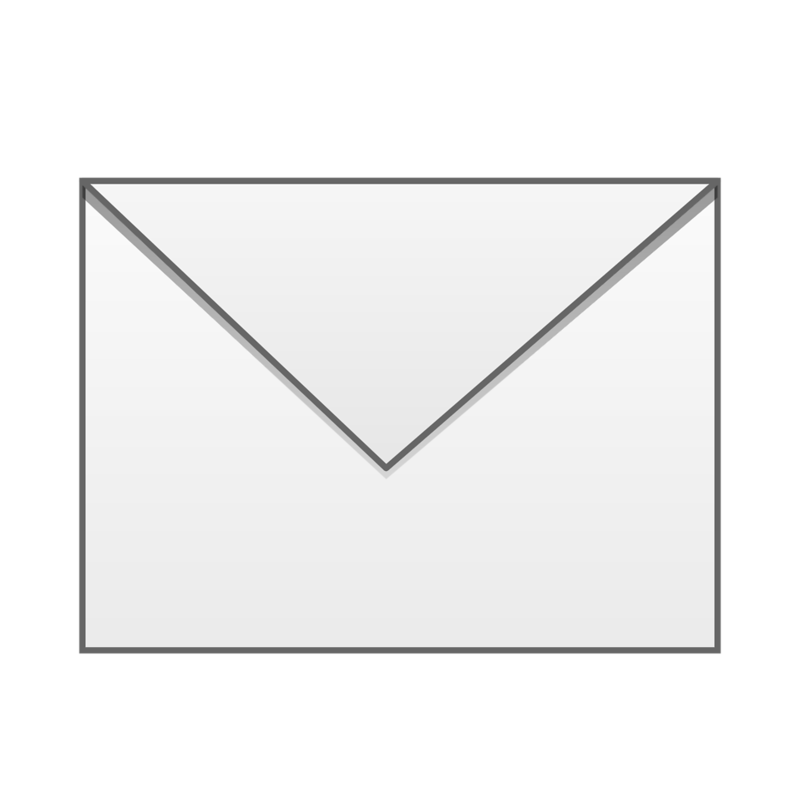 The Balinese name Trimurti refers to the Gods representing Wind, Water and Fire. 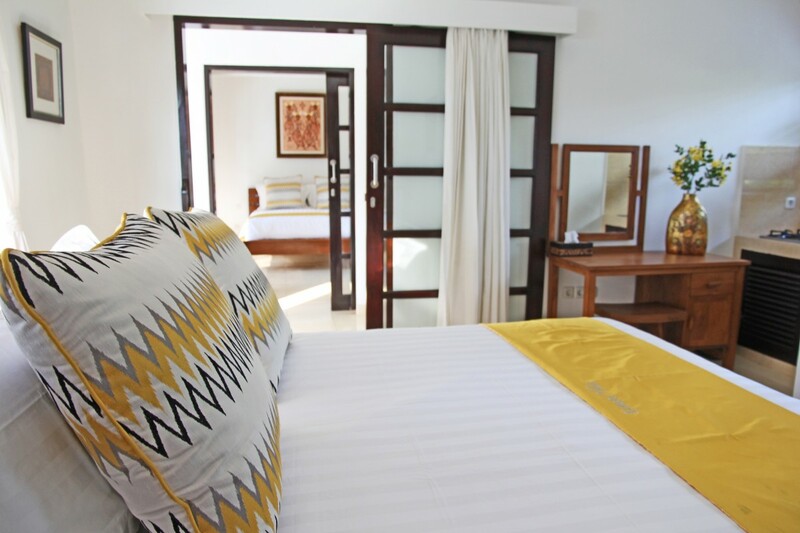 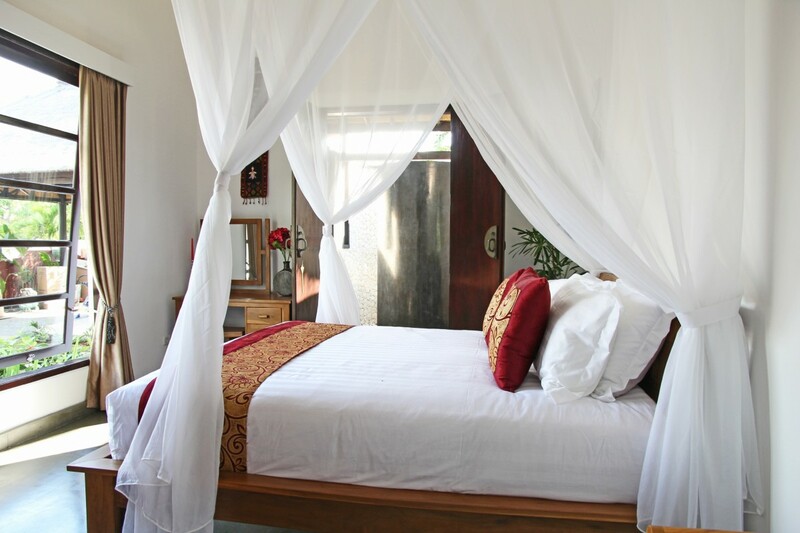 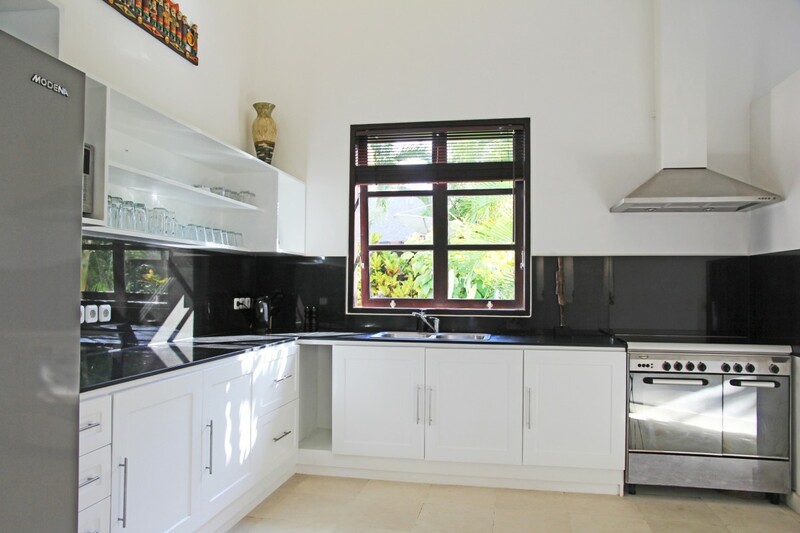 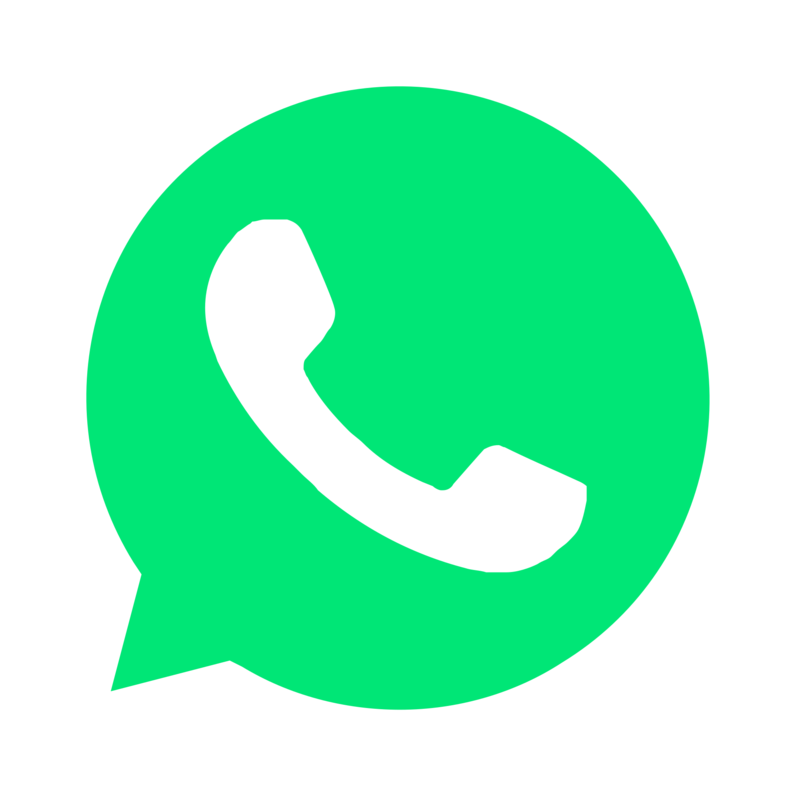 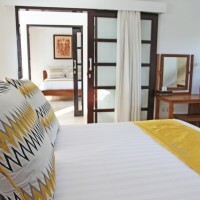 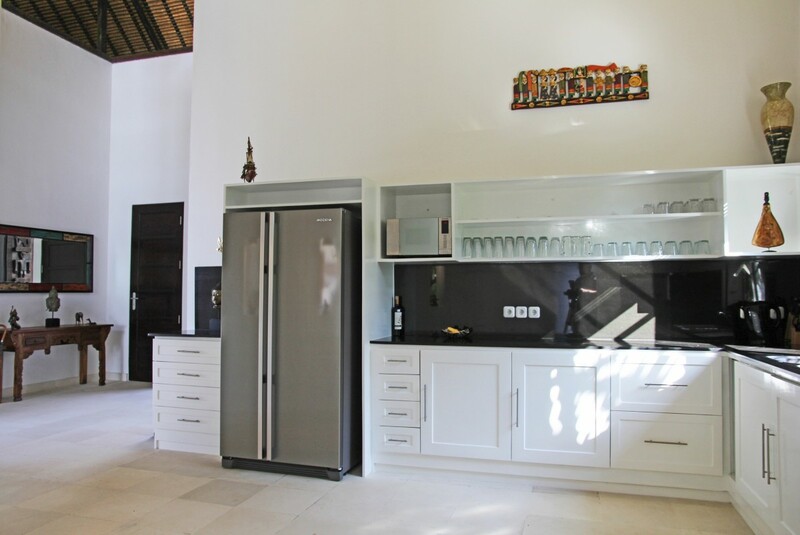 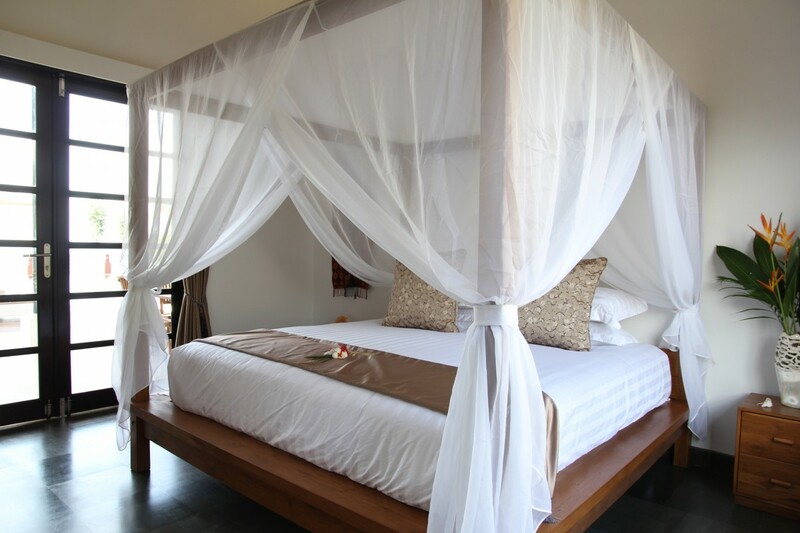 In addition to the spacious main house with 3 bedrooms, all with air conditioning, large double beds and a luxury en-suite bathroom, brings the guest house with two bedrooms, which also have air conditioning and double beds, the total capacity of 10 sleeps. 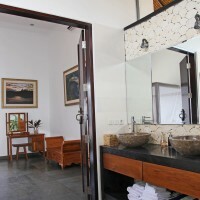 These spacious bedrooms have also their private bathroom. 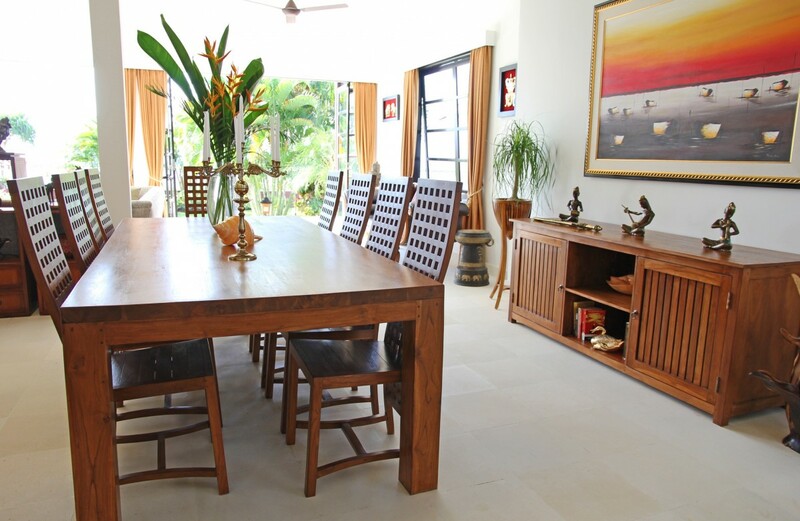 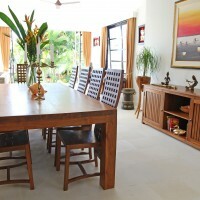 The L-shaped living room is luxuriously and comfortably furnished with sofas and dining table for 10 people. 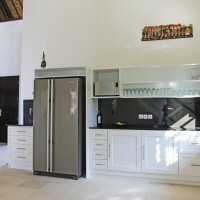 The flat screen TV with international channels and movie channels provide, together with a complete surround sound system, the necessary entertainment. 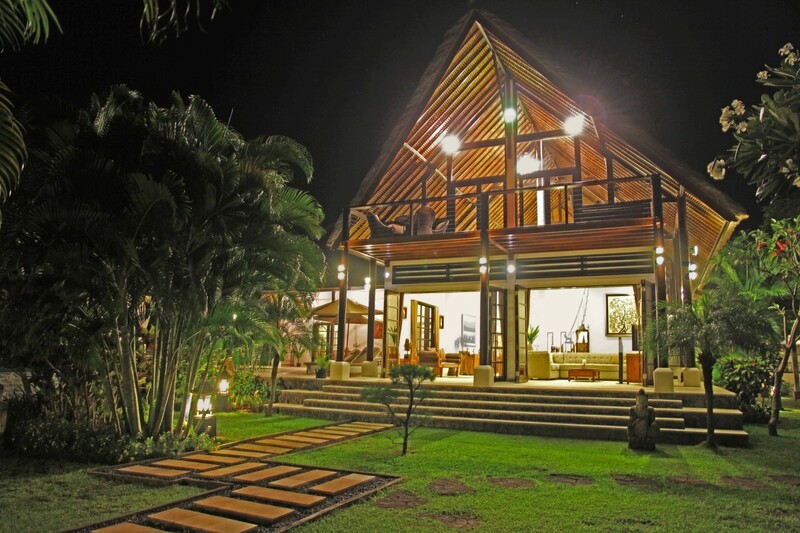 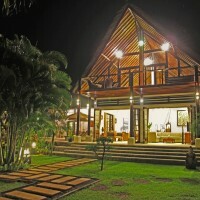 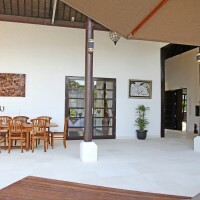 The main house has two floors and the loft has a bar for a refreshing cold beer and a music system. 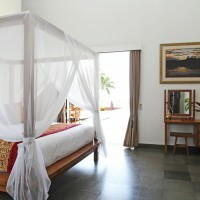 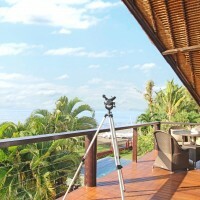 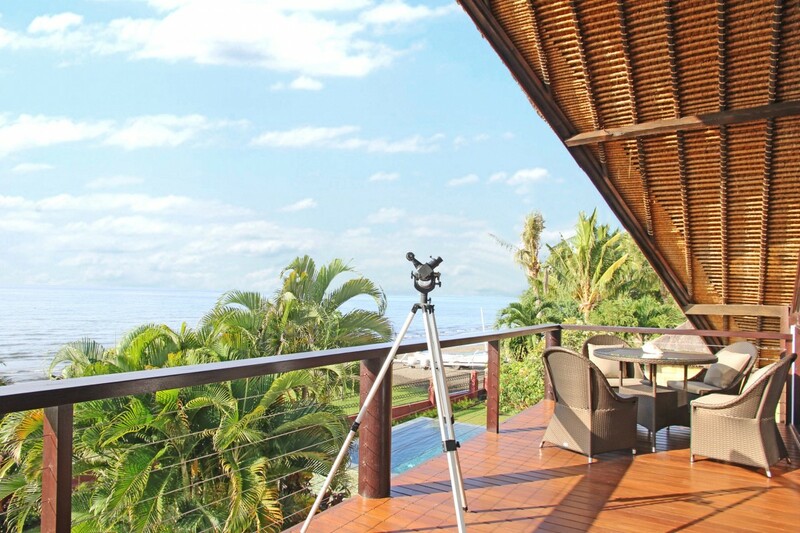 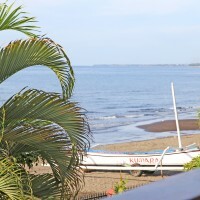 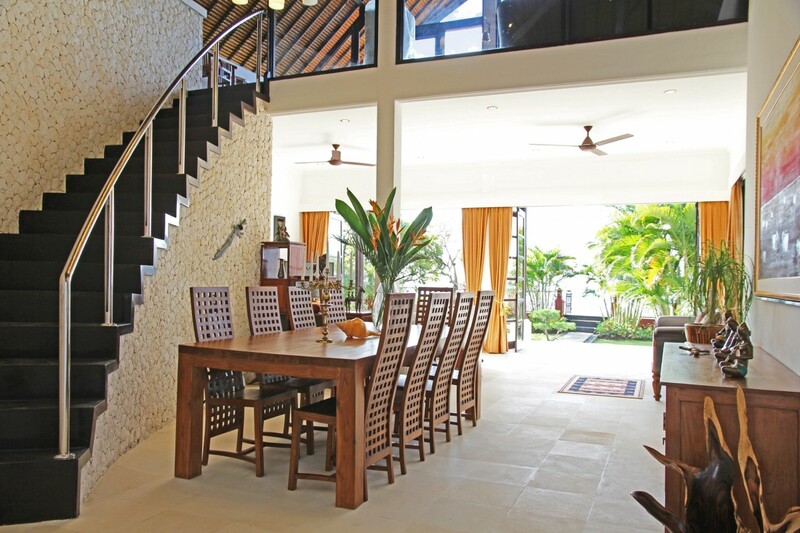 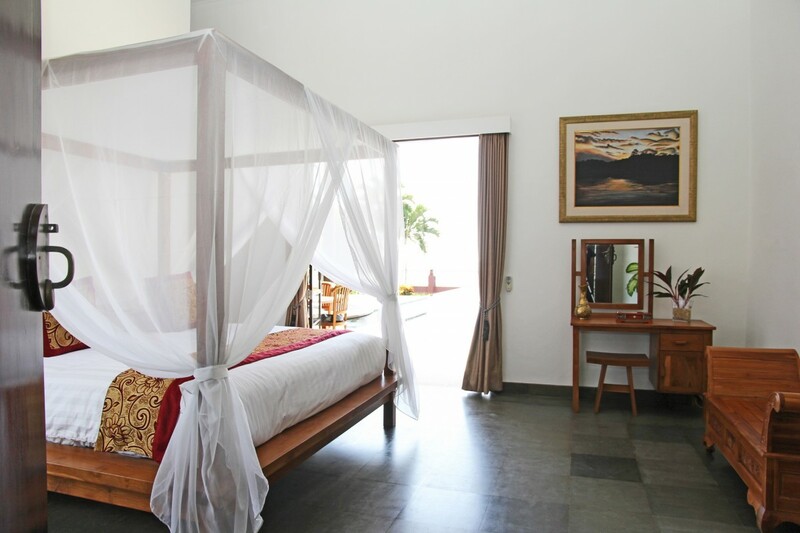 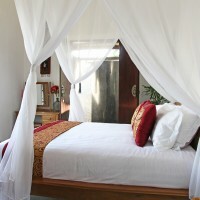 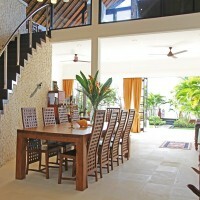 On the balcony you can enjoy a 180-degree view over the Bali Sea and the vicinity of the village of Temukus. 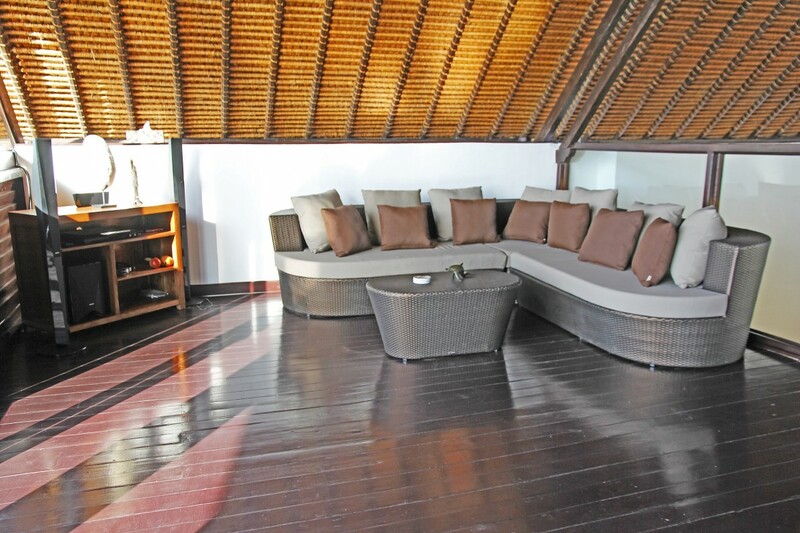 Directly on the lounge-covered terrace, with a large dining table for 12 people, you can cool down in the 16 mtr. 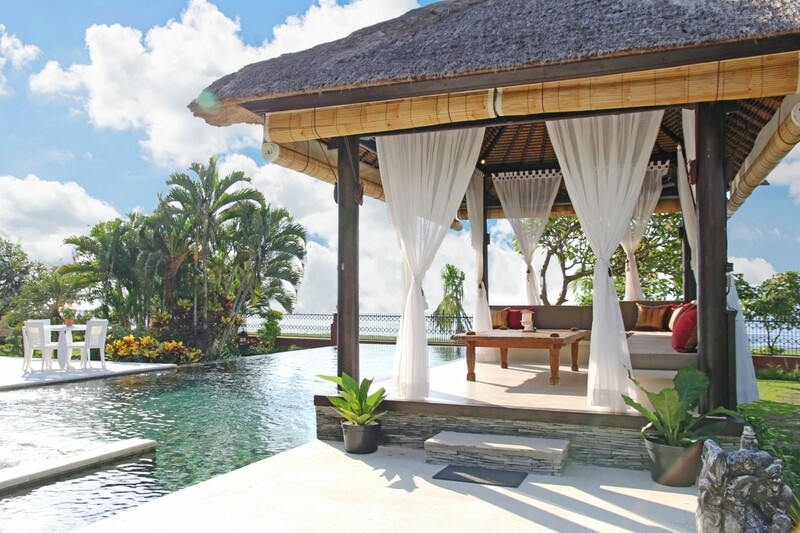 long infinity pool with large jacuzzi. 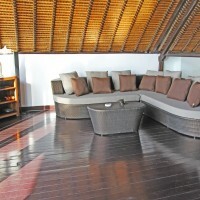 The adjacent pool deck has room for a sitting area and of course comfortable sunbeds with matching umbrellas. 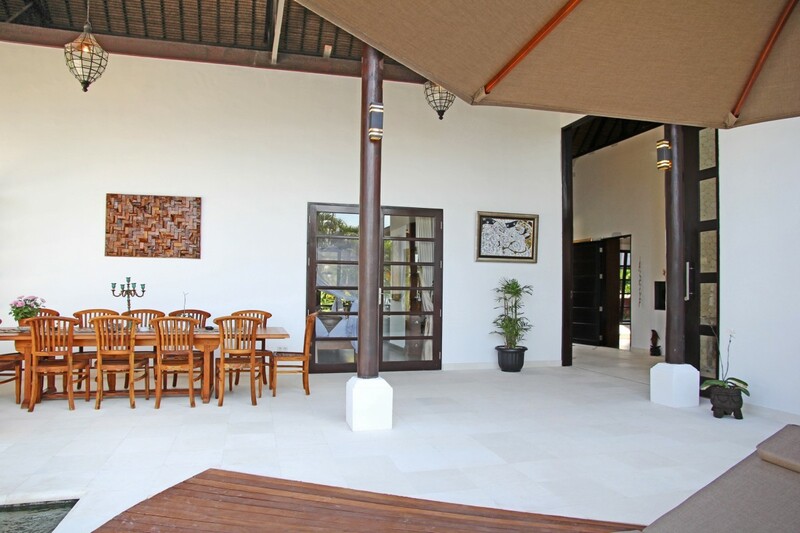 The pavilion ‘bale benong’ offers a wonderful place to rest, read or enjoy the sea with or without your favourite music in the background. 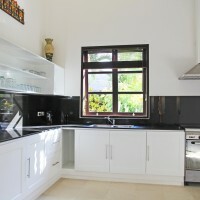 The spacious kitchen with modern appliances including oven, toaster, blender and so is the work domain of our house lady’s who can provide here your requested meals. 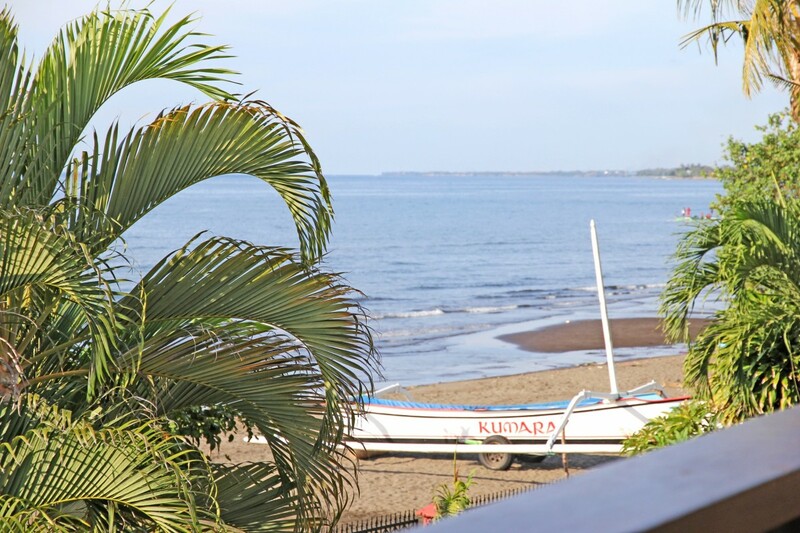 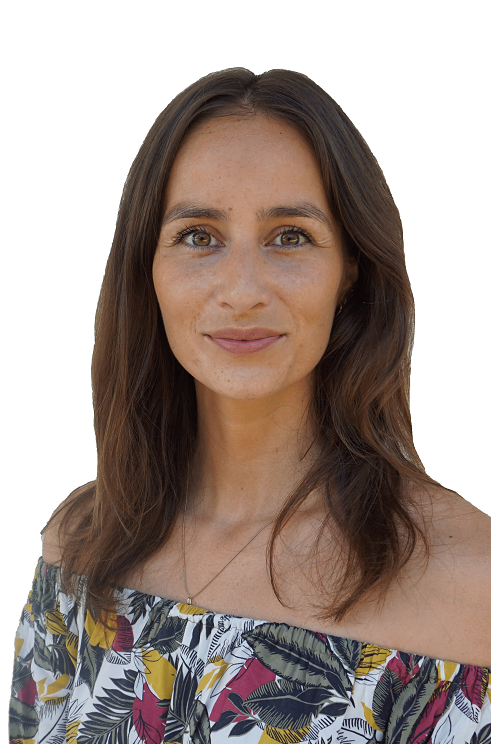 For dolphin watching, to relax fishing or snorkelling and diving you can hire a Balinese prahu from the local fishermen and they will bring you with their colourful boats to the most ideal spots. 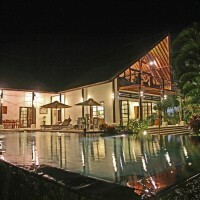 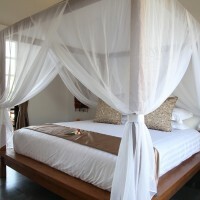 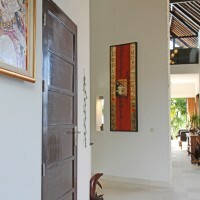 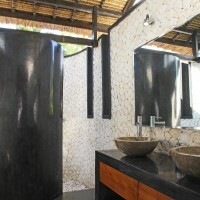 With pleasure we welcome you as a guest in our villa for a tranquil sunny holiday.